Vladimir, S., et al. Stenting of Extensive Occlusive Disease of the Iliac Segment In Patients with High Cardiovascular Risk. (2017) J Heart Cardiol 3(1): 16- 21. © 2017 Vladimir, S. This is an Open access article distributed under the terms of Creative Commons Attribution 4.0 International License. The purpose of our study was to evaluate immediate and long-term results of endovascular treatment in patients with a high risk of cardiovascular events and radiographic or angiographic evidence of extensive occlusive disease of iliac segment (TASC C, D). Methods: We have included in this prospective, non-randomized study 166 patients with the diagnosis of atherosclerotic aortoiliac occlusive disease. All patients had a high risk of cardiovascular events and an objective evidence of TASC C, D iliac occlusive disease. One hundred and six iliac endovascular procedures were performed. Results: Early (< 30 days) stent thrombosis was detected in 4 cases (2.4%). In 4 (2.4%) patients, there was an evidence of post-procedural distal thromboembolism. The mean follow-up was 38.8 months. At the end of the 48-month follow-up period, thrombosis of the stented iliac segment was detected in 16 (9.6%) patients. In 14 (8.4%) patients, above-the-knee amputation was required. The cumulative primary stent patency at 1, 2, 3 and 4 years was 94,3 ± 2.3%; 86.3 ± 3,6%; 75,2 ± 5,3% and 68,9 ± 7,3% respectively. The limb salvage rate in our study at 1, 2 and 3 years was 96.2 ± 2,1%, 90 ± 3.3 and 86,3 ± 4.8%, respectively. Conclusions: Iliac artery stenting is an effective minimally invasive treatment for high surgical rick patients with extensive occlusive iliac disease (TASC II type C and D), at least in the mid-term. Surgical revascularization of aortoiliac occlusive disease has good procedural results and has been the gold standard of therapy for decades. Endovascular therapies for treatment of aortoiliac disease is an alternative to open surgery particularly in the patients who have contraindications for surgery and are otherwise considered high risk for open surgical repair. Percutaneous Transluminal Angioplasty (PTA) and stenting for aortoiliac occlusive disease confers the advantages of lower morbidity, faster recovery, and shorter hospital stays[1-3]. According to the recommendations of the Inter-Society Consensus for the Management of Peripheral Arterial Disease (TASC II) statement, endovascular management is the method of choice for the treatment of type A lesions. Reconstructive surgery is preferred for type D lesions. Patients with type B and C lesions can be managed using either stenting or bypass surgery. The technical success rate of type C and type D lesions has been reported to range from 92% to 95%[3,4]. Outcomes of stents to treat more complex lesions including TASC C/D and chronic total occlusions lesions are also encouraging. According to a recent series, immediate technical success rates for aortoiliac intervention (TASC C, D) exceeded 90%, with 4 – 5 year primary patency rates of 60 – 86%, secondary patency rates of 80 – 98%, and limb salvage rates of 98%[5-7]. The development of new endovascular devices has heralded expansive opportunities and indications for the endovascular or minimally invasive treatment of patients with aortoiliac occlusive disease. The purpose of our study was to evaluate immediate and long-term results of endovascular treatment in the patients with high risk of cardiovascular events and radiographic or angiographic evidence of extensive occlusive disease of iliac segment (TASC C, D). We prospectively enrolled consecutive patients with aortoiliac disease treated in the Division of vascular and Endovascular Surgery at the Academician E.N. Meshalkin Novosibirsk State Budget Research Institute of Circulation Pathology, Ministry for Public Health Care Russian Federation into a database. Our study was approved by Local Ethics Committee of Academician E.N. Meshalkin Novosibirsk State Budget Research Institute of Circulation Pathology, Ministry for Public Health Care Russian Federation and all patients entered the study after the procedure of informed consent. Between 2010 and 2015, we performed 166 endovascular procedures to treat patients with symptomatic aortoiliac occlusive disease. We have included in this study 166 patients with high risk of cardiovascular events and radiographic or angiographic evidence of TASC II type C and D iliac occlusive disease. During that time period, we have performed more than 1,000 iliac endovascular procedures (TASC A, B and hybrid procedures) and 395 aortobifemoral bypasses. Before endovascular intervention all patients were investigated with color Doppler ultrasonography (Ankle-Brachial Pressure Index (ABI) measurements) and MDCT angiography. The lengths of iliac artery lesions on MDCT angio-reconstructions were measured. Preprocedural arteriography is indispensable for analyzing the lesion (exact location, percentage, and length of the stenosis; and diameter of the artery); for collecting information about the nature of the lesion (eccentric, ulcerated, or calcified), the inflow vessels, the runoff, and the collateral circulation; and for choosing the best approach. Duplex ultrasonography is also performed before the procedure to characterize the lesion and to provide a baseline study. In cases of arterial occlusions, a computed tomographic scan is performed to exclude the presence of aneurysms. Patients with non-compressible vessels were most commonly followed with Pulse Volume Recordings (PVRs). It was our custom to perform coronary angiography on all patients in the study before the intervention. Brachiocephalic vessels color Doppler ultrasonographyfor all patients were performed. Patients included in our cohort had with chronic critical ischemia (stage 4, 5, 6 Rutherford classifications) and were at high risk for cardiovascular events. We evaluated the operative comorbidity risk using the Society for Vascular Surgery (SVS) comorbidity grading system. The European System for Cardiac Operative Risk Evaluation (Euro SCORE) was used. The predicted mortality was calculated by adding the weights assigned to each factor. Patients were included in the study if their stenosis or occlusive lesion of iliac arteries was considered suitable for stenting and a successful lesion recanalization was achieved (only de novo lesions were included in the study). All patients with focal and extensive iliac obstructive disease that underwent endovascular iliac revascularization were included only if the stenosis of the Common Femoral Artery (CFA) was less < 50%. Stenosis of the Profundafemoris artery (PF) was less than 50%. Stenosis (50% – 99%) and occlusion of the ipsilateral CFA or PF were categorized as poor runoff. Those patients were not included in our study. Hybrid procedure (common femoral endarterectomy and iliac stenting) was performed when CFA and PF stenosis were > 50%. Patients with acute limb ischemia, aortic thrombosis, concomitant abdominal aortic or iliac aneurysms were excluded. In order to balance the group, patency was evaluated separately for both limbs. In the last few years we started performing Endovascular Interventions (EIs) for chronic critical limb ischemia and extensive occlusive disease of the iliac segment (TASC C, D) even in high-risk patients. PTA/stenting procedure was considered successful when all accessible vessels were revascularized to a less than 20% residual stenosis based on angiographical evidence. Lesions in the iliac segment were categorized according to the Inter-Society Consensus for the Management of Peripheral Arterial Disease (TASC II) document. The TASC classification was used to evaluate stages of the iliac occlusive disease in a group of patients. Technical Notes: The stent should cover the entire lesion. The diameter of the stent must precisely match the size of the vessel. When occlusion makes the exact diameter of the artery difficult to measure, it is helpful to refer to the contralateral site. In addition to appropriate sizing of the stent, we emphasize gradual and gentle dilation during deployment in order to avoid complications such as adjacent dissection, perforation, or rupture of the arterial wall. Self-expandable nitinol stents take several hours or even days after their deployment to expand fully. These stents should be dilated immediately after placement rather than waiting for the stent to expand on its own. The length of lesions was categorized by the criteria of the Society of Cardiovascular and Interventional Radiology (SCVIR) and was classified into three categories: lesions of 3 – 5 cm, lesions of 5 – 10 cm, and lesions greater than 10 cm in length. Hemodynamic success and clinical improvement were defined according to the reporting standards of the Society for Vascular Surgery and the International Society for Cardiovascular Surgery. Early outcomes (≤ 30 days from surgery) were evaluated based on periprocedural data, associated morbidity, and mortality in the group. We evaluated the improvement after the interventions based on the absolute differences between the preoperative and postoperative Ankle Brachial Index (ABI). The average length of follow-up was 38.8 months (range, 6 – 48 months). The follow-up visit consisted of physical examination, ABI measurement, pulse volume recordings and duplex scan of the iliac stent as well as the CFA and PF at 6, 12, 24, 36, 48 months. If there was a suspicion of stent or iliac segment restenosis (>50%), a CT angiogram was obtained for further evaluation. All endovascular interventions were performed under local anesthesia. A retrograde approach was always attempted first. Ipsilateral, contralateral and brachial approaches were used in selected patients based on the clinical situation. If the retrograde access to the aorta failed, we attempted the antegrade crossing of the iliac occlusion with intention to reenter the lumen in CFA. We did not use re-entry devices. The brachial access site is used in cases of failure of deployment through another site or when other sites are inaccessible. After the recanalization and balloon angioplasty of the iliac artery we implanted a stent. Primary stenting of external iliac lesions was performed with self-expanding nitinol stents. Primary stenting of common iliac artery lesions (with severely calcified segment) were carried out with balloon-expandable stents (Omnilink Elite, Abbott; Visi-Pro™, EV3). Diameters range from 8 to 10 mm. Some long occlusions were treated with self-expanding nitinol stents (PROTEGE™ EverFlex™, EV3; Absolute, Abbott) after iliac recanalization. The diameters vary between 7 and 9 mm. For long lesions of the external iliac artery, our practice was to extend the treatment zone with PTA or stenting down to the superior border of the inguinal ligament. In such cases we specifically avoided crossing the inguinal ligament to avoid kinking of the stent during natural hip and waist movement. EIs were performed in an angiography suite under the control of TOSHIBA Infinix VF –i /SP (Japan). After EIs we prescribed to the patient’s aspirin (100 mg per day) and clopidogrel (75 mg per day) therapy for 6 months. After 6 months, aspirin (100 mg per day) was recommended for lifetime. The quantitative data are presented as a mean and Standard Deviation (SD). For testing the statistical hypothesis, the significance level of 0.05 was selected. For comparing the mean values from two dependent groups, the paired-samples t test was used. Categorical variables were compared using chi square test. The primary patency and the assisted primary patency were determined by Kaplan–Meier method. Cox proportional hazards model was used to assess risk factors of primary patency. ROC-analysis was used for evaluating prognostic value of the stent length for primary patency. To perform calculations we used the statistical package Med Calc v15.2.2. One hundred and six iliac endovascular procedures were performed in 166 patients and 278 stents were implanted. The mean follow-up time was 38.8 months (range, 6 – 48). Patient population included 123 (74%) men and 43 (26%) women. The average patient age was 69 ± 7.7. All patients had a medical history significant for systemic arterial hypertension (100%), 166 (100%) had coronary artery disease (stable 116 (70%) or unstable 50 (30%) angina), 145 (87%) had dyslipidemia and 22 (13%) had Type II diabetes. One hundred and eighteen (71%) patients had ischemic rest pain alone (Rutherford 4), 32 (19%) patients had non-healing lower extremity ulcers (Rutherford 5) and 16 (10%) had gangrene (Rutherford 6). All patients were either current or past smokers. One hundred and thirteen (68%) patientswere treated with coronary artery stents based on results of their coronary angiography. Ten (6%) patients had preoperative renal insufficiency (dialysis independence, creatinine ≥ 1.5 mg/dL) were hydrated before and after the procedure with sodium bicarbonate solution. Nineteen (11%) patients had >70% carotid stenosis and 13 (7.8%) of these patients with critical carotid stenosis (>90%) carotid endarterectomy was performed as the first stage of the treatment. Lesions of the aortoiliac segment were categorized according to the Inter-Society Consensus for the Management of Peripheral Arterial Disease (TASC II) document (lesions C –106 (64%) patients, lesions D 60 (36%) patients). In our study the number of the lesions in each category (according to SCVIR) was as follows: 7 lesions of 3 – 5 cm, 94 lesions of 5 – 10 cm, and 65 lesions of more than 10 cm. Patients were included in the study if they had evidence of extensive occlusive iliac disease (TASC II type C and D), the occlusion was considered suitable for stenting and the lesion was successfully crossed. Iliac artery occlusion recanalization failure occurred by 3(1.8%) patients during EI. In 3 cases aortofemoral bypass was successfully carried out. In 130 (78%) cases occlusion of ipsilateral Superficial Femoral Artery (SFA) was found. In all cases in our study the status of the ipsilateral common femoral artery (CFA) and Profundafemoris (PF) was categorized as a good runoff. Patients’ demographic, clinical characteristics and number stents are shown in Table 1. Table 1: Baseline demographic, lesion characteristics and number stents. The mean length of the stented segments was 98.8 ± 18.8 mm (range, 40 – 180 mm). 144 stents were placed in type C lesions (52%), and 134 stents in type D lesions (48%). Subintimal angioplasty was used in 99 (59.6%) cases. Kissing stents were required in 89 (53.6%) cases where the contralateral side was diseased and it was expected to encroach on the lumen if a unilateral stenting approach was employed. Procedural complications included a 9% rate of major groin hematoma that did not require surgical intervention or transfusion. In these cases groin closure was accomplished via manual compression (severe calcification of the femoral artery). Procedural thromboembolisms occurred in 4 (2.4%) cases and were successfully treated with Fogarty thrombectomy. During recanalization and stenting of the iliac artery in 3 (1.8%) cases we had a perforation of the treated artery during predilation, treated by stent-graft implantation (Atrium Advanta V12, MAQUET). After iliac stenting 13 patients underwent planned toe amputation. Early (< 30 days) stent thrombosis was detected in 4 patients (2.4%): in the two cases, a self-expandable stent (8 mm × 100 mm) was implanted in a TASC II type C lesion of the EIA; in the two cases, a balloon-expandable (8 mm × 59 mm) and self-expandable stents (7 mm × 100 mm) were implanted to treat unilateral occlusion of both the CIA and the EIA (type D lesion). Later in all cases hybrid procedures (thrombectomy using a Fogarty catheter, PTA of external and common iliac arteries in combination with common femoral artery angioplasty) had to be performed for the progressing rest pain. Procedural and early (< 30 days) post-procedural complications are shown in Table 2. Table 2: Procedural and Early (< 30 day) Outcomes of Endovascular Iliac Stenting. During follow-up, 10 (6%) patients died. The causes of death were deemed to be associated with myocardial infarction (after 6, 12, 12, 15, 18, 16, 30, 36 months) and stroke (after 13, 35 months). Table 3: Late (> 30 days) post-procedural complications. At the end of the 48-month follow-up period, thrombosis of the stented iliac segment was detected in 16 (9.6%) patients. In 14 (8.4%) patients, above-the-knee amputation was required. Aortobifemoral bypass was performed in one case due to acute aortic thrombosis. In one case, hybrid endovascular procedures (thrombectomies using a Fogarty catheter, PTA of external and common iliac arteries in combination with common femoral artery angioplasty) were performed. Late (>30 days) post-operative complications are shown in Table 3. After endovascular intervention of iliac occlusion 41 (25%) patients was categorized as Rutherford stage 1, 73 patients (44%) as Rutherford stage 2, and 52 (31%) patients as Rutherford stage 3. The ABI significantly increased in all the patients after iliac stenting. The ABI was 0.22 (SD, 0.08) before the iliac stenting and 0.64 (SD, 0.14) after the procedure (P < 0.001). The cumulative primary stent patency at 1, 2, 3 and 4 years was 94,3 ± 2.3%; 86.3 ± 3,6%; 75,2 ± 5,3% and 68,9 ± 7,3% respectively (Figure 1). 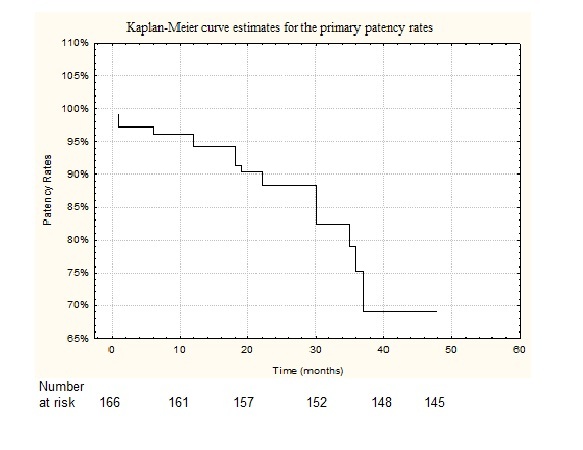 Figure 1: Kaplan–Meier curve estimates for the primary patency rates in the patients treated with iliac artery stenting. In 14 cases (8.4%), in-stent restenosis (> 50%) was detected (color Doppler ultrasonography was performed). Four of the patients had a TASC II type C lesion prior to initial endovascular iliac intervention and ten of the patients with in-stent restenosis had a TASC II type D lesion prior to endovascular iliac intervention (length of stenting segment ≥ 10 cm). In-stent restenosis was successfully corrected by PTA in all 14 patients to < 20% residual stenosis. In our study (control angiography) stent fractures were not determined. The primary assisted stent patency at 1 and 2 years was 96% ± 2.8% and 92% ± 4.4%, respectively. The limb salvage rate in our study at 1, 2 and 3 years was 96.2 ± 2,1%, 90 ± 3.3 and 86,3 ± 4.8%, respectively (Figure 2). 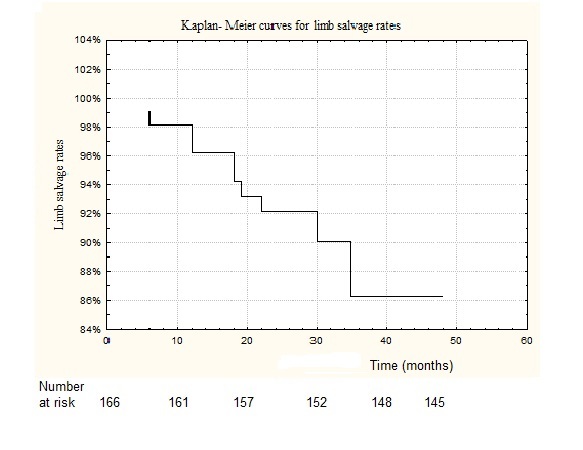 Figure 2: Kaplan- Meier curves for limb salvage rates. Sixteen (9.6%) patients after aortoiliac endovascular recanalization and stenting of the CIA and EIA developed stent thrombosis (after 6, 6, 12, 12, 15, 18, 19, 20, 22, 30, 30, 35, 36, 36, 22, 37 months). The length of the recanalized and stented segments was 10 cm and more. Other 25 (15%) patients had restenosis (patency <50%, length of stented segment ≥ 10 cm). Stent length had an effect on the primary patency according to the ROC analysis (Figure 3). Stent length of 100-mm produced a sensitivity of 85.7% and a specificity of 93.1%. 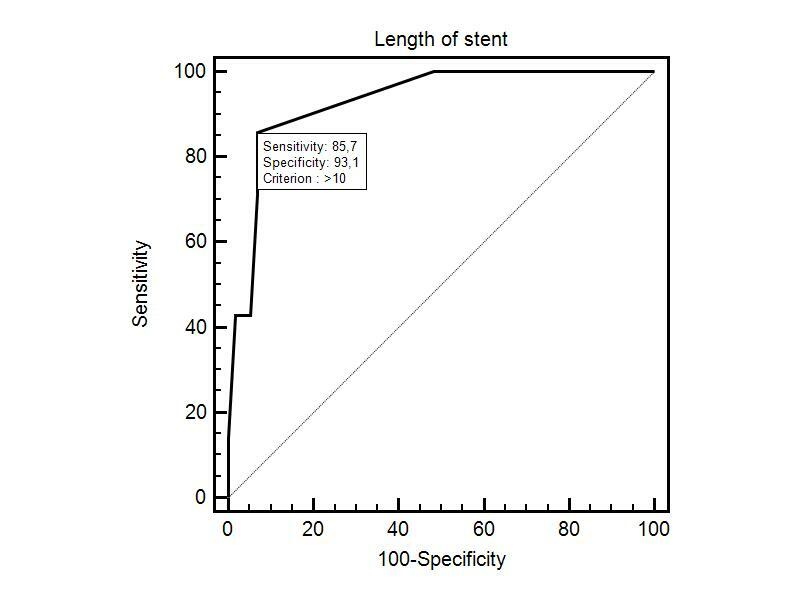 Figure 3: ROC curve for stents with an optimal stent length cut point of 100 mm. The primary patency rate at 24 months was 91.7% ± 7.9% for the stents ≤ 100 mm and 78.3% ± 10.3% for the stents >100 mm, respectively (P = 0.033). 82 patients had iliac stents longer than 100 mm. Logistic regression analysis revealed that longer stents covering both the CIA and EIA had a negative effect on primary stent patency (OR, 1.053; 95% CI, 1.023 – 1.085; P = 0.0007). The Cox regression analysis showed a higher risk of stent thrombosis or in-stent restenosis in stents >100 mm (HR, 1.052; 95% CI, 1.020 - 1.082; P = 0.001). The increase in stent length by 1 mm was associated with 5% increase risk of thrombosis or instent restenosis. Recent publications[13-15] reported 1-year primary iliac stent patency rates from 83.0% to 92.5%. Prospective multicenter BRAVISSIMO study had 325 patients enrolled; 190 patients were in the TASC A/B group and 135 - in the TASC C/D group. In the TASC A/B group and the TASC C/D group, 12-month primary patency rates were 97.1% and 95%, respectively. These results of endovascular treatment for TASC C/D are compared with TASC A/B aortoiliac lesions[16,17]. In our study (high-risk patients with critical ischemia) the cumulative primary stent patency for 1 and 3 years was 94.3 ± 2.3% and 75.2 ± 5.3%, respectively. Patients with stenosis (50% – 99%) and occlusion of the ipsilateral CFA or PF were not included, but referred for hybrid procedures. The cumulative morbidity and mortality rates in our study were low. All patients had coronarography before endovascular treatment. Following it, in 113 cases (68%) we performed coronary stenting. In 13 (7.8%) patients with critical stenosis of carotid artery (> 90%) we carried out carotid endarterectomy. Early (< 30 days post procedure) complication rate was 15.6% and included access site major hematoma, vessel perforation, thromboembolism of distal artery and stent thrombosis. In our study, distal embolization following stent implantation was detected in 4 patients (2.4%). Other authors have reported the rate of complications listed above from 3% to 12%[18,19]. Some authors have found statistically significant differences in patency rates between the iliac artery stent length and localization[20,21]. Kavaliauskienėa Ž et al. have analyzed 54 consecutive patients with aortoiliac atherosclerotic disease. In this study the primary patency rates at 24 month were 86.6% ± 5.8% for the stents ≤ 61 mm and 60.2% ± 12.0% for the stents >61 mm, respectively (P = 0.016). Other studies, however, failed to report a statistically significant difference in patency rates between the iliac artery stent length and localization[21,22]. In the current study, in the absence of angiographic confirmation we relied on a combination of change in ABI/PVR, recurrence of ulcer/symptoms and duplex findings when available to most accurately determine the primary patency. In our study primary patency rates at 24 month were 91.7% ± 7.9% for the stents ≤100 mm and 78.3% ± 10.3% for the stents >100 mm, respectively (P = 0.033). During the follow-up period, thrombosis of the stented iliac segment was detected in 16 cases. This complication was found to develop in patients who underwent recanalization and stenting of the CIA and EIA. The length of the recanalized and stented segments was ≥ 10 cm all 16 cases. In addition, in 14 (8.4%) cases restenosis > 50% (length of stenting segment ≥ 10 cm) was diagnosed. During recanalization and stenting of the iliac artery in 3 (.8%) cases patients with considerable calcification of aorto-iliac segment had artery perforations, requiring stent-graft implantation. Patients with long lesions requiring the implantation of stents > 100 mm and patients with radiographic or angiographic evidence of severely calcified aorto-iliac arterial segments may benefit from open surgical revascularization. Despite complications, the limb salvage rate at 3 years in high surgical risk patients with critical limb ischemia in our study was 86.3 ± 4.8%. Unfortunately, our study has some limitations. This was a prospective non-randomized study in a referral center where many patients come from different regions of Russia; thus, consistent follow-up is difficult. Nevertheless, most patients who returned for a follow-up at 1 year or less were also evaluated in subsequent years, allowing assessment of mid-term results and survival at 3 years. Longer follow-up would be ideal and may reveal data that could alter our current conclusions. Iliac artery stenting is an effective minimally invasive treatment for high surgical rick patients with extensive occlusive iliac disease (TASC II type C and D). The risk of stent thrombosis or in-stent restenosis development is higher for patients with stent length >100 mm. Patients with severely calcified aortoiliac segments are at an increased risk of vessel perforation during surgical revascularization. 1. Hussein, E., Fouad, S.E., Ahmed, S., et al. Endovascular management of Flush Common Iliac Artery Occlusive Disease (FCIAOD); an Egyptian perspective. (2011) Kasr El Aini Journal of Surgery 12: 51-58. 2. Norgren, L., Hiatt, W.R., Dormandy, J.A., et al. Inter-Society Consensus for the management of peripheral arterial disease (TASC II). (2007) J Vasc Surg 45(1): S5-S67. 3. Hans, S.S., De Santis, D., Siddiqui, R., et al. Results of endovascular therapy and aortobifemoral grafting for Transatlantic Inter-Society type C and D aortoiliac occlusive disease. (2008) Surgery 144(4): 583-590. 4. Park K.B., Do Y.S., Kim J.H., et al. Stent placement for chronic iliac arterial occlusive disease: the results of 10 years experience in a single institution. (2005) Korean J Radiol 6(4): 256-266. 5. Jongkind, V., Akkersdijk, G.J., Yeung, K.K., et al. A systematic review of endovascular treatment of extensive aortoiliac occlusive disease. (2010) J Vasc Surg 52(5): 1376-1383. 6. Ye, W., Liu, C.W., Ricco, J.B., et al. Early and late outcomes of percutaneous treatment of Transatlantic Inter-Society Consensus class C and D aorto-iliac lesions. (2011) J Vasc Surg 53(6): 1728-1737. 7. Goode, S.D., Cleveland, T.J., Gaines, P.A. STAG Trial Collaborators. Randomized clinical trial of stents versus angioplasty for the treatment of iliac artery occlusions (STAG trial). (2013) Br J Surg 100(9): 1148-1153. 8. Chaikof, E.L., Fillinger, M.F., Matsumura, J.S., et al. Identifying and grading factors that modify the outcome of endovascular aortic aneurysm repair. (2002) J Vasc Surg 35(5): 1061-1066. 9. Roques, F., Michel, P., Goldstone, A.R., et al. The logistic EuroSCORE. (2003) Eur Heart J 24(9): 881-882. 10. Starodubtsev, V., Karpenko, A., Ignatenko, P. Hybrid and open surgery of Trans-Atlantic Inter-Society II type C and D iliac occlusive disease and concomitant lesion of common femoral artery. (2016) Int Angiol 35(5): 484-491. 11. Guidelines for percutaneous transluminal angioplasty. Standards of Practice Committee of the Society of Cardiovascular and Interventional Radiology. (1990) Radiology 177(3): 619-626. 12. Rutherford, R.B., Baker, J.D., Ernst, C., et al. Recommended standards for reports dealing with lower extremity ischemia: revised version. (1997) J Vasc Surg 26(3): 517-538. 13. Moise, M.A., Alvarez-Tostado, J.A., Clair, D.G., et al. Endovascular management of chronic infrarenal aortic occlusion. (2009) J Endovasc Ther 16(1): 84-92. 14. Giles, H., Lesar, C., Erdoes, L., et al. Balloon-expandable covered stent therapy of complex endovascular pathology. (2008) Ann Vasc Surg 22(6): 762-768. 15. Soga, Y., Iida, O., Kawasaki, D., et al. Contemporary outcomes after endovascular treatment for aorto-iliac artery disease. (2012) Circ J 76(11): 2697-2704. 16. Bosiers, M., Deloose, K., Callaert, J., et al. BRAVISSIMO study: 12-month results from the TASC A/B subgroup. (2012) J Cardiovasc surg (Torino) 53(1): 91-99. 17. Gates, L., Indes, J. New treatment of iliac artery disease: focus on the Absolute Pro® Vascular Self-Expanding Stent System. (2013) Med Devices (Auckl) 6: 147-150. 18. Ichihashi S, Higashiura W, Itoh H, et al. Long-term outcomes for systematic primary stent placement in complex iliac artery occlusive disease classified according to Trans-Atlantic Inter-Society Consensus (TASC)-II. J VascSurg 2011; 53(4): 992–999. 19. Koizumi, A., Kumakura, H., Kanai, H., et al. Ten-year patency and factors causing restenosis after endovascular treatment of iliac artery lesions. (2009) Circ J 73(5): 860-866. 20. Kavaliauskienėa, Ž., Benetisa, R., Inčiūraa, D., et al. Factors affecting primary patency of stenting for TransAtlantic Inter-Society (TASC II) type B, C, and D iliac occlusive disease. (2014) Medicina 50(5): 287-294. 21. Sharafuddin, M.J., Hoballah, J.J., Kresowik, T.F., et al. Kissing stent reconstruction of the aortoiliac bifurcation. (2008) Perspect Vasc Surg Endovasc Ther 20(1): 50-60. 22. Kashyap, V.S., Pavkov, M.L., Bena, J.F., et al. The management of severe aortoiliac occlusive disease: endovascular therapy rivals open reconstruction. (2008) J Vasc Surg 48(6): 1451-1457.